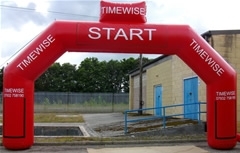 Vistabanners.co.uk manufacture a wide range of 2 leg and 4 leg Inflatable Advertising Arches/Gantry. We can design and manufacture a custom built inflatable advertising arch to suit your needs in all shapes, sizes and colours. Artwork can be printed directly to the arch or onto detachable banners. Our Inflatable arches can be set up in minutes and when rolled up they will fit in the back of an average size car/van. They have the capability to be powered by either an electric (240v) fan unit, or alternatively, a petrol powered generating unit. To support and stabilise the Arch, a sandbag is placed in each leg and 2 rope lengths are attached from each side to be fixed either to the ground, barriers or any street furniture that is available.